Due to the possibility of landsides north of Nickel Creek, the north end of this trail is expected to be open every summer and closed every winter. However, it may be closed at any time if landslides occur or appear to be possible. The trail will eventually be re-routed to reduce the danger of landslides. 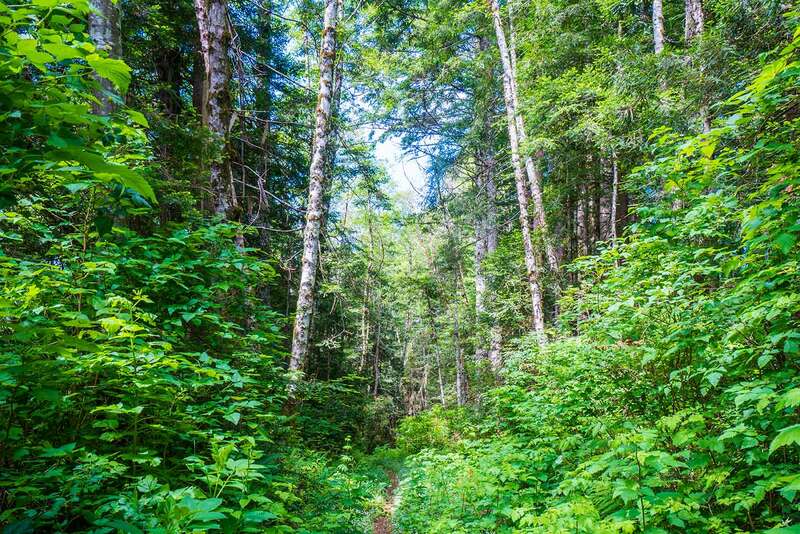 Most of the trail, including the entire old-growth section, can still be seen by hiking out and back from the south end, starting at the Damnation Creek Trail. 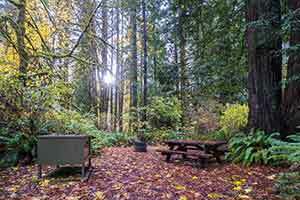 The Nickel Creek campground is closed indefinitely. 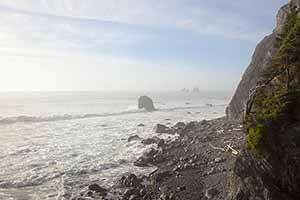 This isolated trail, located just south of Crescent City, climbs up to and then runs along a high coastal bluff under alders and second-growth redwoods. After three miles the trail turns inland, leaving behind the constant white noise of the surf to enter a strikingly silent old-growth redwood forest. 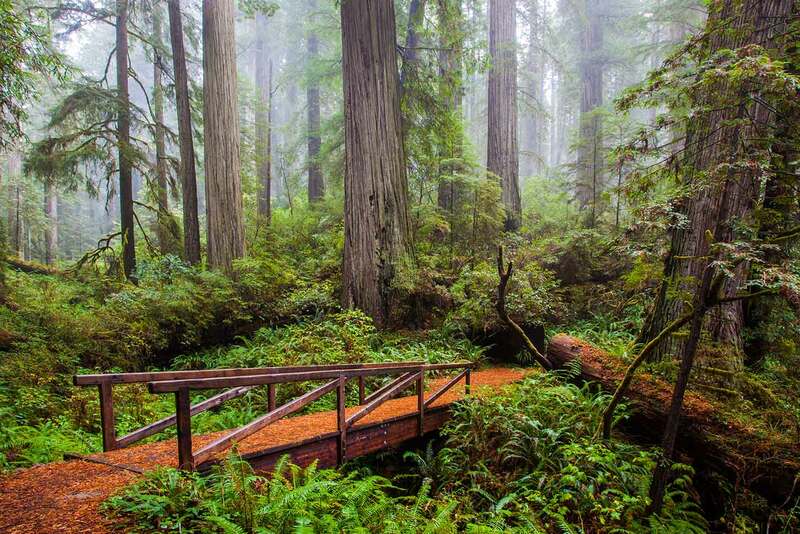 The redwoods get increasingly impressive until the trail reaches Damnation Creek. The first three miles of trail is a lot like the Hidden Beach section, except the Last Chance section clearly follows an old alignment of the Redwood Highway. Although it’s mostly covered up and overgrown, in places the pavement with its white center stripe is still visible. In fact the road is so overgrown that at first glance it looks like a singletrack trail, but it’s not as engaging as a purpose-built singletrack would be: the wide, flat roadbed separates you from the forest and is too straight and flat, with fewer curves to leave you wondering what’s around the next bend. Also, a dense understory grows alongside the road and screens views of the trees. On the other hand, much of the understory is made up of rhododendron trees, and there are some rhododendron blooms in May. There aren’t any ocean views to speak of, just glimpses of the water and of Crescent City. 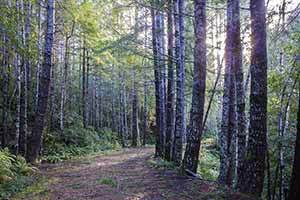 It’s possible to just hike the old-growth part of the trail and skip the non-redwood parts. 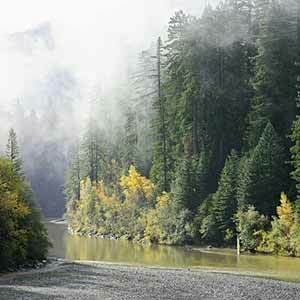 Start at the south end of the trail, at the Damnation Creek trailhead, and go north until the redwoods end. Return the same way. 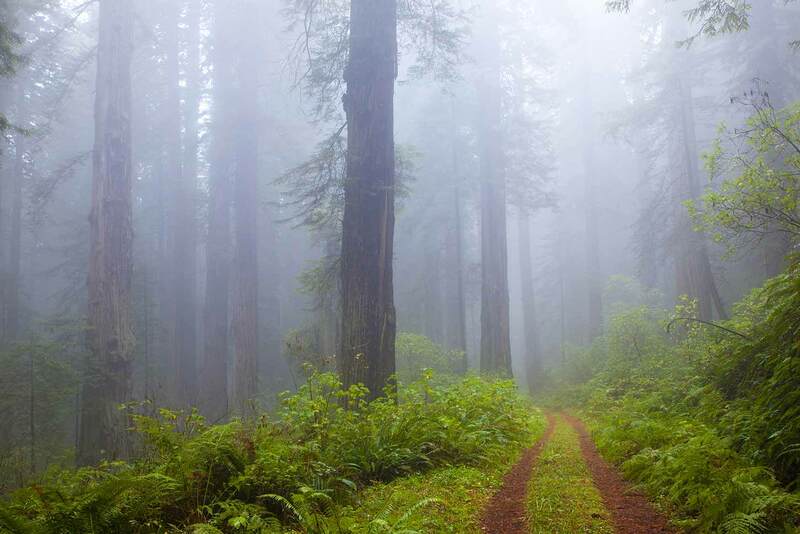 This makes a fine and mostly flat 10-mile out-and-back hike entirely in old-growth redwoods. 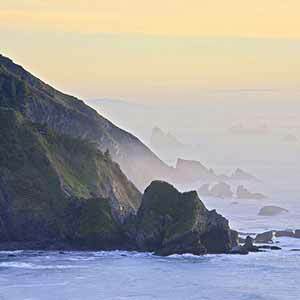 From the south, drive north on Highway 101 through Del Norte Coast Redwoods State Park. Descend past the Crescent City viewpoint and, just after reaching the bottom of the hill, turn left onto Enderts Beach Road. Continue along this road until it dead-ends at a parking lot. 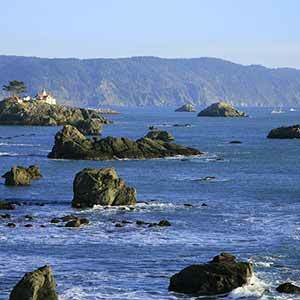 From the north, drive south on Highway 101 through Crescent City. 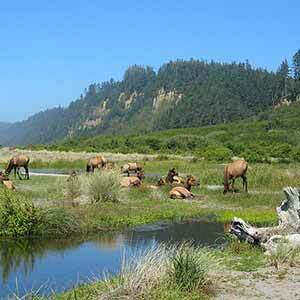 Just before the highway begins its climb into Del Norte Coast Redwoods State Park, turn right on Enderts Beach Road. Continue along this road until it dead-ends at a parking lot. The trail starts at the end of Enderts Beach Road, where there’s a small parking lot. The trail starts out level with some views of the ocean below. After an intersection with a trail to the beach, the trail begins to climb steeply, switchbacking up a hillside covered in a sparse mixture of trees. 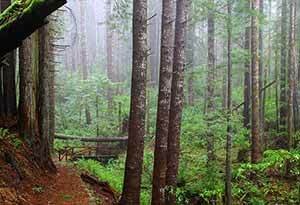 The route gradually levels off and proceeds through groves of white-barked alder, alternating with second-growth redwood groves and dense blackberry thickets. The trail is cut into the steep hillside high above the surf, but due to the wide roadbed it’s not exactly vertigo-inducing, except perhaps for a few short stretches where the trail has been narrowed due to erosion or landslides. Parts of the trail are slightly overgrown, but overall it’s in good condition. The distant hooting of the Crescent City foghorn can sometimes be heard. 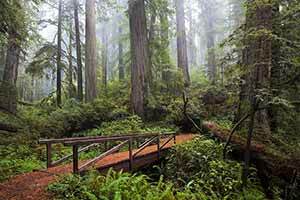 At about mile 3, the trail swings left and enters an old-growth redwood forest. This appears to be a natural boundary and not the result of logging, since the redwoods are at first small and rather plain-looking. A helpful sign explains how salt spray from the surf keeps redwoods from growing near the ocean. 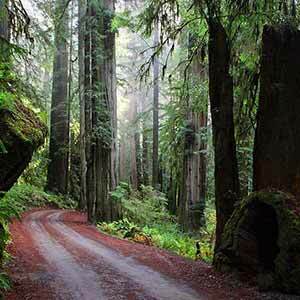 As the trail progresses inland the redwoods gradually get more impressive, and the forest gets darker and cooler. 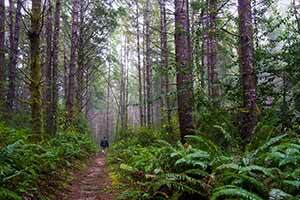 Typically for a redwood upland, there’s a healthy understory of huckleberry and rhododendron. At one point the trail passes a gully where some large redwoods grow. Near the beginning of the redwoods you can sometimes hear the distant whine of trucks grinding up and down Highway 101, but mostly the woods are silent. 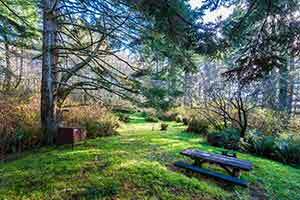 The scenery abruptly improves as the trail nears Damnation Creek, which flows through a large ravine with an especially fine collection of big redwoods. After crossing a footbridge, the trail widens into a double-tracked road with moss and redwood sorrel growing between the tracks. The redwoods become a little more ordinary as you leave the ravine behind, but there are some nice views of attractive old growth above you on the hillside. 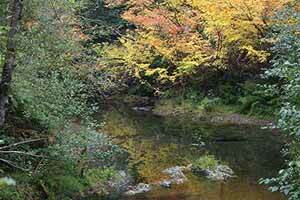 The traffic noise from Highway 101 gets increasingly loud after the creek crossing. The road ascends very gently as it meanders through the lush forest. A few hefty wooden mileposts sit by the side of the road. After a mile or so the woods become more and more impressive, and the best old-growth of the hike is to be found in the last half-mile before the Damnation Creek Trail. 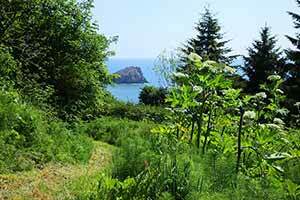 There are some great views downhill of a grove located on a less-steep section of the hill. 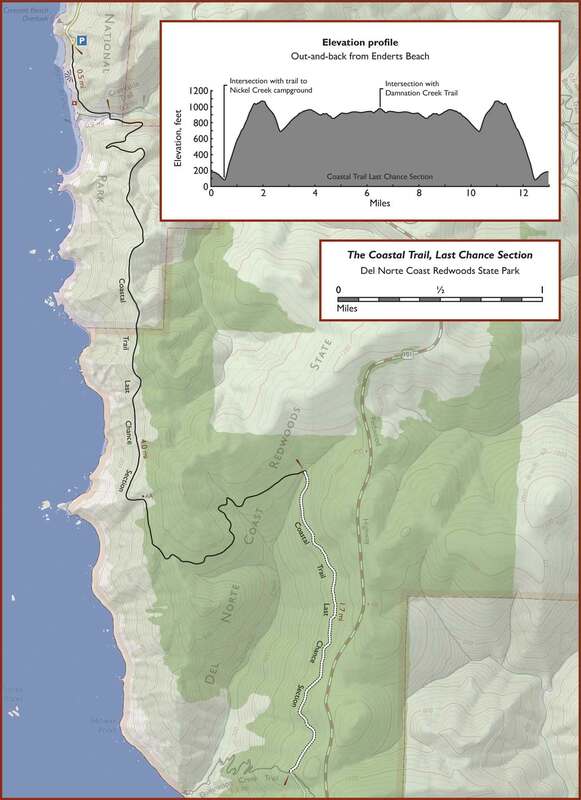 The hike as shown in the map above ends at the Damnation Creek Trail. Past the Damnation Creek Trail, the road stops ascending and begins a gentle descent. The really big redwoods end in just a few hundred yards, then the forest becomes increasingly open as the redwoods gradually peter out. At the same time, the roar of the surf gets louder. 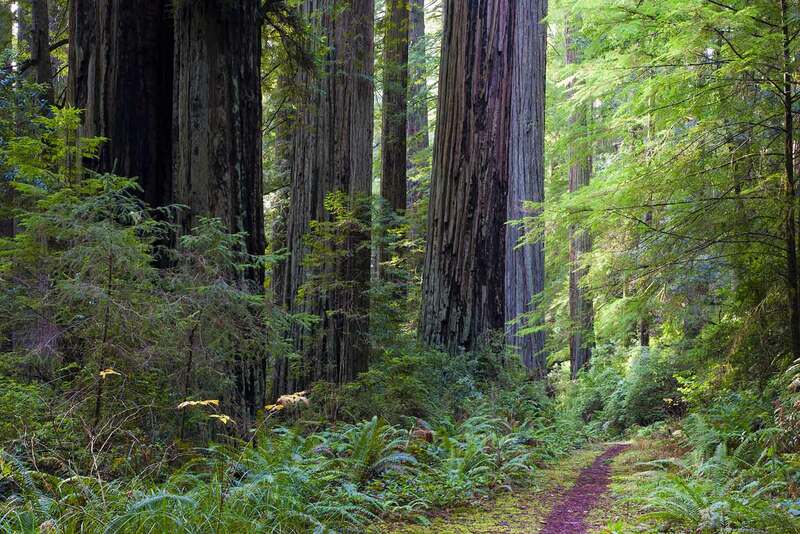 The trail leaves the redwoods completely just a few yards before reaching Highway 101.